Western blot analysis of whole cell lysates probed with tubulin beta 4b antibody followed by detection with HRP conjugated Goat anti Rabbit IgG antibody (1/10,000, STAR208P) and visualized on the ChemiDoc™ MP with 3 second exposure. Arrow points to tubulin beta 4b (molecular weight 53 kDa). 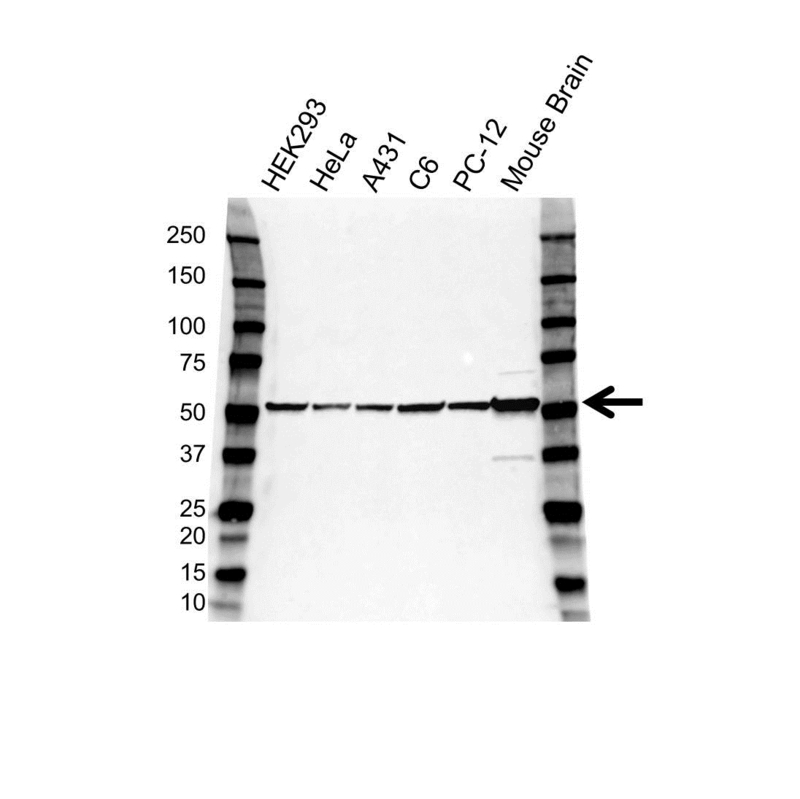 Rabbit anti-human tubulin beta 4B antibody recognizes tubulin beta-4B chain, also known as class IVb beta tubulin, tubulin beta-2 chain or TUBB4B. This antibody has been extensively validated for western blotting using whole cell lysates. Rabbit anti Human tubulin beta 4B antibody recognizes tubulin beta 4B chain, also known as class IVb beta tubulin, tubulin beta-2 chain or TUBB4B. Rabbit anti Human tubulin beta 4B chain antibody detects a band of 53 kDa. The antibody has been extensively validated for western blotting using whole cell lysates. Anti tubulin beta 4B detects a band of approximately 53 kDa in C6 cell lysates.